That dreadful Super Bowl Sunday weather forecast you may have heard about for Philadelphia this week may not be as bad as previously thought, forecasters indicated on Saturday. A low-pressure system out of the Tennessee Valley is still expected to dump a steady, soaking rain in the afternoon and evening hours, as Super Bowl parties get set to kick off around Philly and the surrounding area. But it may not last for the night as forecasters initially predicted earlier in the week. The National Weather Service station in Mount Holly said on Saturday that the rain is now expected to come to a quick end on Sunday night, with temperatures dropping into the 30s and falling throughout the night and the early-morning hours. According to hourly forecasts on Saturday, the storm looks poised to taper off starting around 10 p.m. Sunday, right when Super Bowl LII between the Philadelphia Eagles and New England Patriots should be coming to an end. Precip will come to a quick end Sunday night, but unfortunately temps will be dropping quickly as well. That'll be welcome news for fans hoping to take part in an epic celebration on Broad Street afterward. 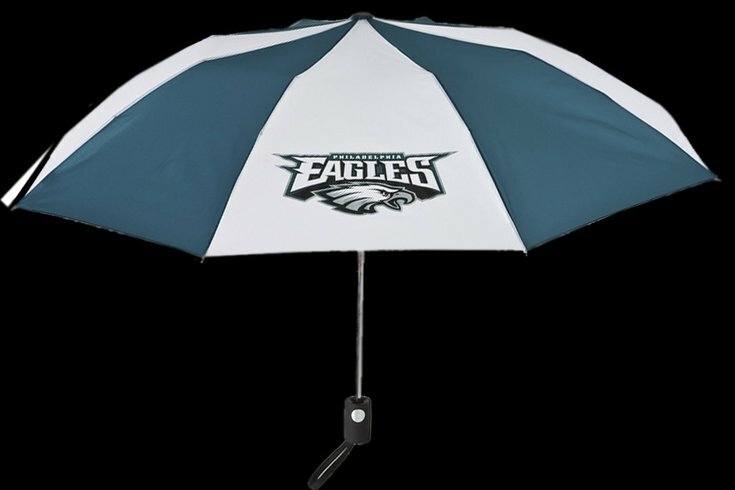 Although would a bit of rain actually keep them away in the event of an Eagles win? Of course not. Saturday afternoon: Mostly sunny, with a high near 34. Southwest wind around 10 mph. Saturday night: Increasing clouds, with a low around 26. South wind around 8 mph. Sunday: Rain, mainly after 1 p.m. High near 45. South wind around 7 mph. Chance of precipitation is 100 percent. New precipitation amounts between a quarter- and a half-inch possible. Sunday night: Rain before 3 a.m., then a slight chance of snow and sleet between 3 a.m and 4 a.m., then a slight chance of rain and snow after 4 a.m. Low around 30. Southeast wind 5 to 14 mph becoming west after midnight. Chance of precipitation is 100 percent. Little or no snow and sleet accumulation expected. Monday: Sunny, with a high near 34. Breezy, with a northwest wind 11 to 20 mph, with gusts as high as 30 mph. Tuesday: Partly sunny, with a high near 41. Tuesday night: A chance of rain and snow between 8 p.m. and 11 p.m., then a chance of rain after 11 p.m. Mostly cloudy, with a low around 33. Chance of precipitation is 50 percent. Wednesday: Rain likely, mainly after 8 a.m. Cloudy, with a high near 51. Chance of precipitation is 70 percent. Wednesday night: Rain likely before 11 p.m., then a chance of snow. Cloudy, with a low around 29. Chance of precipitation is 70 percent. Thursday: A chance of snow. Partly sunny, with a high near 37. Chance of precipitation is 50 percent. Thursday night: Partly cloudy, with a low around 25. Friday: Mostly sunny, with a high near 41.